I have been given my very first award, courtesy of Melanie of Bag and a Beret. 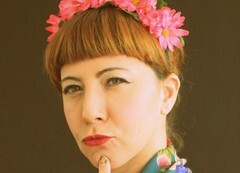 It is a great honour as Melanie’s blog is one of my favourites: her wit and art are a lot of fun, not to mention the fun outfits. So, now I must complete a quiz Melanie put together, so you can all get to know me better! Definitely a solar powered E-reader. I’m not outdoorsy enough to be able to use the pocket knife well, enough and a couple of books would be great to spend the time with. Sometimes, but not all the time, or else I’d be double the size I am! 4. What’s the meaning of life (in ten words or less)? Cuddling with your partner and petting the cats. Deep sea fishing sounds like fun and the Bahamas are very pretty this time of the year, it seems. 6. What’s the scariest movie you’ve ever seen? Maybe Children of Men. It depicts a not so far dystopian future, that seems awfully possible. The baby scene always makes me cry! Definitely Steve Buscemi! He’s very attractive even though he’s not the handsomest man in the world, plus seems to be really nice and a lot of fun! 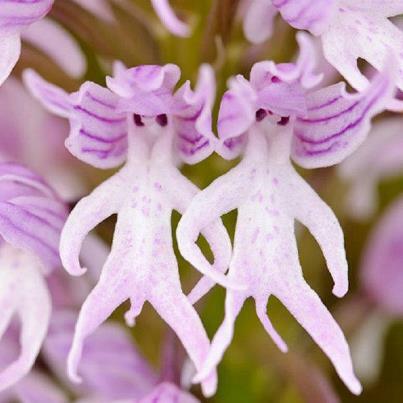 The little men orchids, aren’t they sweet? Yes and it’s quite disturbing. Maybe snakes, they don’t scare me at all and are amazing creatures. Plus it’s my Chinese Zodiac sign. Where the mossy side of the tree trunks are facing. I don’t know why I know this as I have no sense of orientation whatsoever. 1 – I used to work as a colourist before my current job, doing storyboards for advertising and comics with another artist. 2 – when I was a kid I wanted to be a fashion designer. I seem to have forgotten about that for a few years and have later rediscovered an interest for clothes and fashion as means of expression. 3 – One of my dream jobs would be personal shopper – I could go shopping with other people’s money and that would be brill! 4 – I have been blogging on and off since 2003 or so. Good old Livejournal! 5 – I did a runway show when I was 6 years old for the brand Kispo. 6 – I have an unhealthy obsession for shoes but you may have noticed that by now. 8 – I have only just learned how to ride a bicycle. 10 – I have sported a mohican style hairdo a few years back. 11 – I don’t watch tv, so don’t ask me if I’ve seen this or that advert. 5 – Pull Yr Socks Up! 1 – What do you want to be when you grow up? 2 – Sweet or savoury? 3 – What would be your dream home – a palmtree hut at a paradise beach or a log cabin on a snowy mountain? 4 – What was your most embarracing moment ever? 5 – What was the victory you are most proud of? 6 – What was/is your favourite pair of shoes ever? 8 – What is your favourite place to go to in your town? 10 – Are you a cat or a dog person, and why? 11 – What has been the most memorable trip you have made? I sure want to see the answers to these questions!! 4. Create 11 questions for the bloggers you’ve nominated. 5. Go and tell them that they’ve been nominated. I will be away this weekend (again! Yay! this time to Brighton) but will be back with more photos of adventures and outfits next week. In the meantime, don’t forget to have fun! 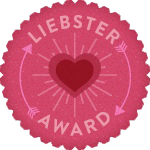 Congrats on your also being Liebstered by Melanie! Fantastic answers – I especially love the little men orchids, mossy trees, and first memory – and great awardee picks! Congratulations!! I always love swinging by your blog. It always has a little something different and I love your photographs. Thank you for the mention of my blog too! And some great new blog friends. Little man orchids? Ca-razy!!!!! Thank you so much for my nomination! I've also been nominated recently by another blogger, but I haven't had time to post about it. Is this legal? I love your answers to the questions, and yes, the orchids are a hit! I'm looking forward to answering your questions, I just need a little time. But again, thank you for thinking of me!! Have a great weekend!! Thanks for this post! It's a big job getting all this together… Your answers are great. I've never seen little men orchids before, I agree, they are sweet! I love your facts, especially the one about drawing all over your stomach (a hint of your tattoos to come maybe?) and how you were a professional colourist. Very cool! Your questions are good – I look forward to reading everyone's answers. Thank you, my dear Rose. Thank you Sara! I appreciate being included. I may not obey the rules (I'm like that…) but I will certainly link to you on my blog! Congrats on your award! I loved reading this and learning more about you! Yay! Congratulations! And thanks so much for the nomination! I'm so honored! ? Oh, and I really loved reading your answers. Little men ordhids are hilarious! I've never seen them in real life. ohhh, so interesting to know something more about dear bloggers!, and so honored for being in your list!, thank you!